PowerPoint® is a great way to create professional multimedia presentations. You can combine text, fonts, graphics, images, animation and HD video using PowerPoint’s flexible drag-and-drop feature to create stunning presentations for your customers. This guide will show you how to display PowerPoint on your TV. 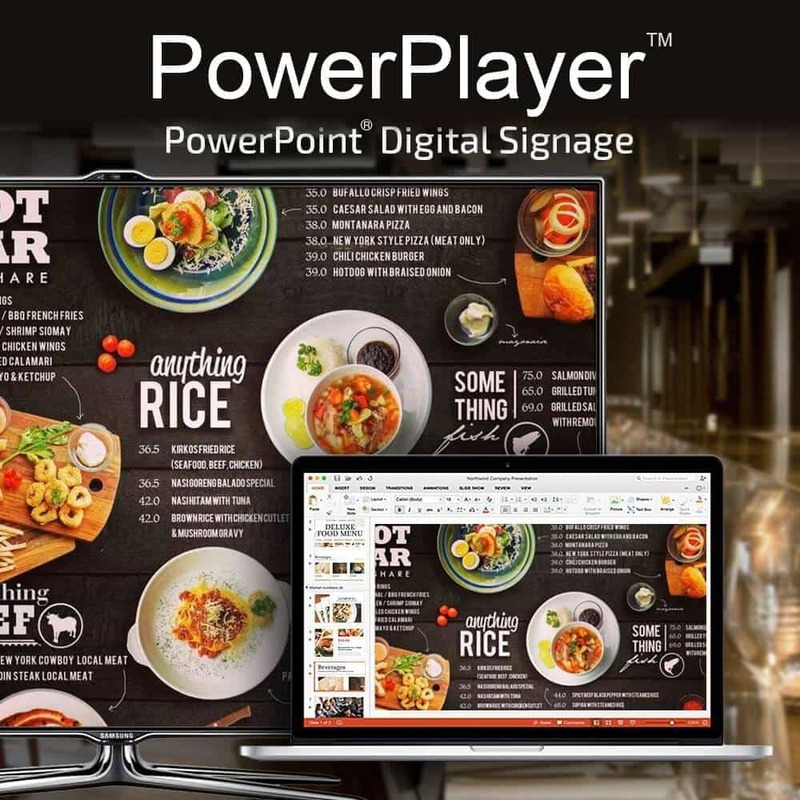 We will also introduce you to PowerPlayer™, our low-cost digital signage player that displays PowerPoint multimedia presentations on any standard TV. 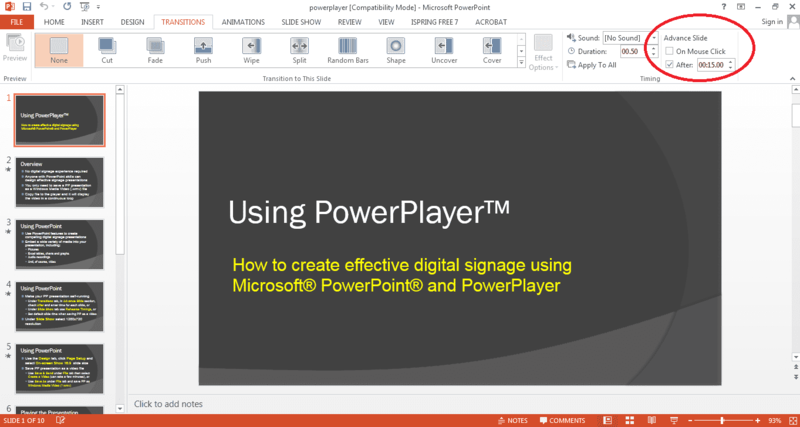 PowerPlayer makes it easy to display PowerPoint on your TV. It includes PowerSignage™, our cloud-based content management service (CMS). Popular use-cases for PowerPoint TV include information kiosks, menu boards and multimedia digital signage advertising. You can install these TV presentation points in restaurants, hotels, banks, shopping centers, corporate lobbies, waiting rooms and tradeshow exhibitions–anywhere people come and go or mill about. PowerPoint digital signage is ideal for small business due to its low cost and overall ease of use. The key requirements is to setup your PowerPoint presentation so it displays in a continuous loop without the need for keyboard actions to advance each slide. When the presentation reaches the end it should automatically loopback to the first slide. In this way you can display PowerPoint on your TV unattended, without the need for any keyboard actions to keep the presentation running continuously. This guide will outline five (5) basic steps needed to display PowerPoint on your TV automatically, in an unattended fashion. We’ll focus on the digital signage use case but these steps can be followed whenever there’s a need to display PowerPoint on a TV; for example, using PowerPoint in an interactive kiosk application. 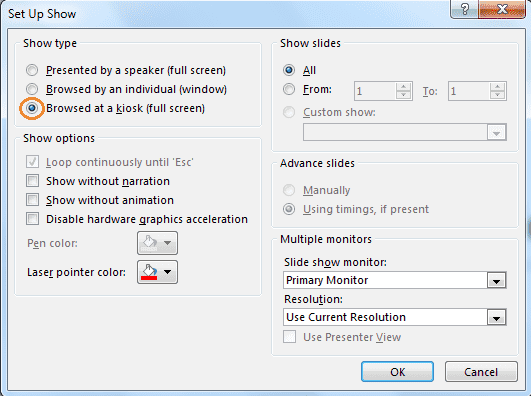 By default slides in a PowerPoint presentation advance only with a mouse click (or keyboard action). In a digital signage presentation you need each slide to be displayed for a specified time and then advance to the next slide automatically. In other words, a PowerPoint digital signage presentation needs to be self-running. To make a presentation self-running click the TRANSITIONS tab on the main menu. On the far right of the TRANSITIONS sub-menu there is the Advance Slide section. For each slide in your presentation uncheck On Mouse Click and check After and enter the number of seconds (or minutes) you want the particular slide to be displayed. If you want the same display time for all your slides click the Apply To All icon. In the above example the first page will be displayed for 15 seconds before moving to the next page in the presentation. By default PowerPoint will automatically end the presentation after the last slide is displayed. When using PowerPoint for digital signage you must configure the presentation to loop back and restart after displaying the last slide. This feature is called kiosk mode. 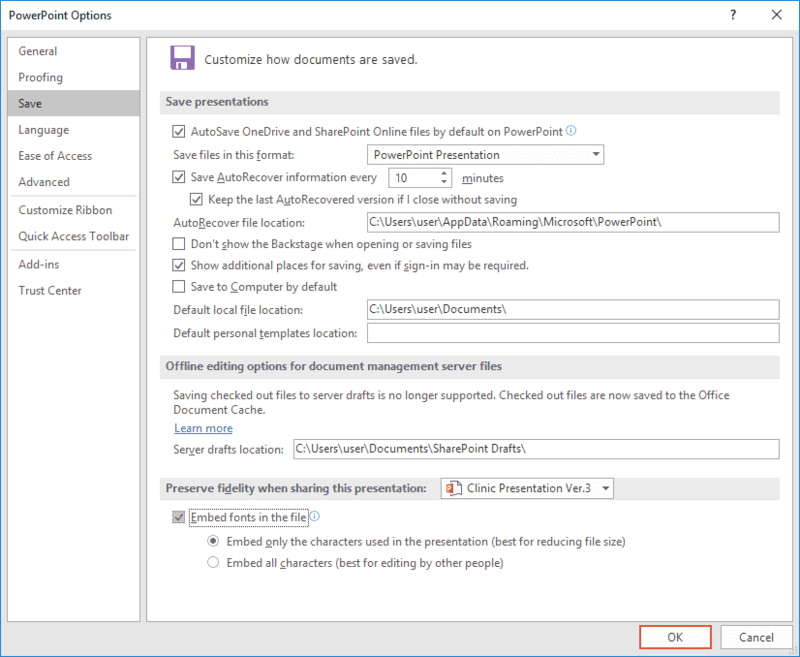 To setup kiosk mode select the SLIDE SHOW tab from the PowerPoint main menu. From this sub-menu click the Set Up Slide Show icon. Nearly all TV displays have a 16:9 (widescreen) aspect ratio. This is the default for current versions of PowerPoint. However, earlier PowerPoint versions defaulted to a 4:3 aspect ratio. To confirm (or manually configure) widescreen orientation for your signage presentation select the DESIGN tab and click Slide Size icon at the far right side. After clicking Slide Size make sure Widescreen (16:9) is selected in the Slide Size drop-down list. By default PowerPoint always assumes that your presentation will be displayed with a landscape (horizontal) orientation on your TV screen. 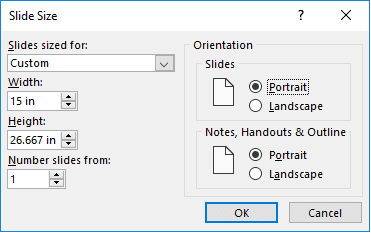 To specify portrait (vertical) orientation for your PowerPoint presentation select the DESIGN tab and click Slide Size. Select Custom Slide Size from the drop-down list (see Figure 4). The Slide Size dialog box will be displayed. Select the Portrait option in the dialog box and press OK. Please note, that you will also need to configure your TV for portrait display orientation as well. This is typically accomplished by a configuration setting in your media player. It is possible that fonts used by your presentation will not be available on PC or media player displaying your PowerPoint digital signage presentation on a TV screen. The PC/media player will use the “best available font” if the font is not available. To solve this problem you should embed your presentation’s fonts into the saved presentation file. Check Embed fonts in file (located at the bottom of the dialog box) and click OK. Doing this will ensure that your PowerPoint digital signage presentation will be displayed on the TV with the correct fonts. To display PowerPoint on your TV you have two (2) choices: using a standard Windows 10 PC or a suitable media player. You can use a used Windows PC for this purpose. You need a PC whose video output that is compatible with your TV display. However, one drawback to using a standard PC is its size. In most use cases you will use a wall-mounted flat screen TV. It may be difficult to “hide” a standard PC behind the TV display. The better option is to use a media player capable of displaying PowerPoint files. Fortunately there is a new class of low-cost hardware called a PC stick; also called a compute stick. The are pocked-sized Windows 10 mini-PC media players that plug into your TV’s HDMI source input and display PowerPoint files. They have onboard storage and built-in Wifi. And because of their small size you can easily hide the PC stick behind the flat screen TV. To display a PowerPoint presentation you must have the PowerPoint application software installed on your PC or media player. However, since this is a display-only TV presentation point you can use the free PowerPoint Viewer. PowerPlayer is a pocket-sized Windows 10 mini-PC digital signage player designed to display PowerPoint on your TV. It plugs into your TV’s HDMI input. PowerPlayer’s low-cost and ease-of-use make it ideal for non-technical users and small business. PowerPlayer is ideal for digital signage applications but it can be used when there’s a need to display PowerPoint presentations on a TV screen; for example in a corporate lobby, corporate presentations and tradeshow exhibitions. PowerPlayer includes PowerSignage™, our cloud-based digital signage content management service (CMS). PowerSignage CMS makes it easy to upload, schedule and display PowerPoint digital signage presentations on your TV screens. PowerPlayer automatically downloads the PowerPoint presentation from the CMS and displays it on your TV screen. It’s PowerPoint plug-and-display ready. PowerPlayer needs Wifi Internet access to download PowerPoint presentations from the CMS and a TV display equipped with an HDMI source input. Once downloaded the PowerPoint presentation is stored in the PC stick’s onboard flash memory. After this point Internet access is only needed to check for new presentations to download. When PowerPlayer is turned on it will automatically display the last downloaded PowerPoint presentation if Wifi Internet is not available. This feature is very useful for displaying preset PowerPoint presentations at locations where there’s no Internet access. For more information please take a look the PowerPlayer brochure or visit our website. Windows and PowerPoint are registered trademarks of Microsoft Corporation. PowerPlayer and PowerSignage are trademarks of Power Media Design.